Remembering When contains everything you need to conduct a comprehensive fire and fall prevention program for older adults in your community. Remembering When is centered around 16 key safety messages – eight fire prevention and eight fall prevention, and includes all of the activities, information, and materials you need. Eight cards that focus on key fire prevention messages for older adults. Download the fire prevention message cards. Eight cards that focus on key fall prevention messages for older adults. 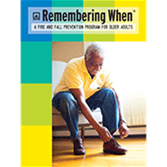 Download the fall prevention message cards. Fire and Fall Prevention Brochure (PDF) – A double-sided brochure ready to print on 8 ½” x 14” paper. Looking for a creative way to review Remembering When safety messages? Consider having a safety fashion show. This powerpoint presentation (PPT) includes fire and fall prevention messages and a sample script. Take a look at video below to see the fashion show in action. NFPA invited local older adults for lunch and “Safety Style Down the Aisle”, an injury prevention fashion show to celebrate Fire Prevention Week at headquarters in Quincy, Massachusetts. NFPA staff members volunteered as models, greeters, and servers to make this a memorable event for our guests. Open house for older adults Conducting an open house for older adults in your community can be both beneficial and rewarding. Program evaluations Learn how the effectiveness of Remembering When is being evaluated.